While DC has been good about adding bookstores (like my neighborhood’s recent addition, East City Books), we do seem to be taking two steps back for every step forward (we lost Books for America and the downtown Barnes & Noble over the last year). 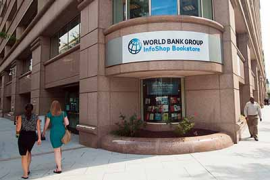 This time, it’s the only in DC World Bank Group InfoShop Bookstore. That’s right. If you didn’t live in DC, you would never know such a thing existed. But it did. And it was super awesome. In addition to World Bank publications, it had a fantastic array of very specialized books on economics and global development. I bought my copy of Tony Judt’s Ill Fares the Land from that particular bookshop. And just… what a cool thing to have in your hometown? Ugh. Another one bits the dust.